Knowing I’d be stuck on airplanes too small to even comfortably open my iPad and keyboard, I asked Twitter whether there was a good app I could use to write with the Apple Pencil. All I wanted was consistently good handwriting recognition and a painless way to get the text into other programs, like Scrivener. 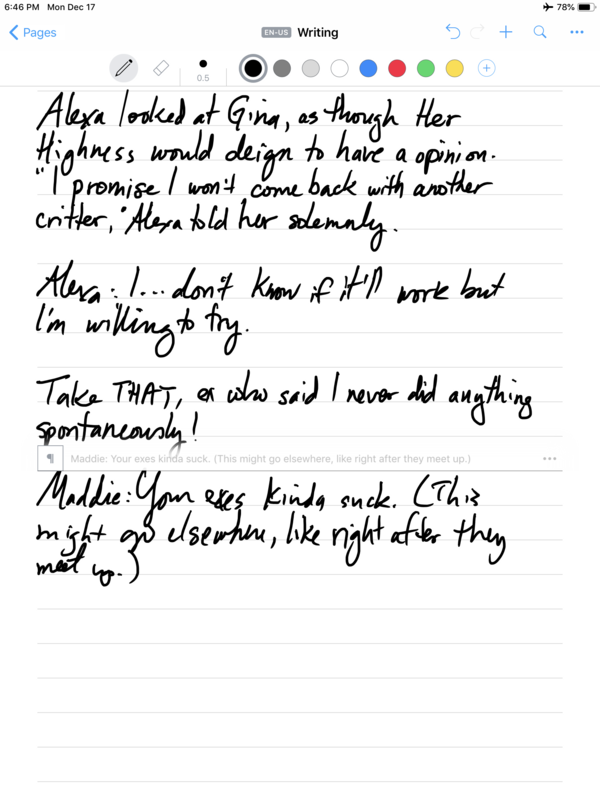 The handwriting recognition? Outstanding. You don’t even have to train it. Look at this mid-flight screenshot. My poor handwriting plus a cramped writing space plus turbulence? No problem. us that look like ss? ts that look like fs? Mutant punctuation? No problem. You can see the text conversion preview floating above the last paragraph. Most sentences were 100% correct right off the bat. A couple had minor errors, but you can fix those on the fly by tapping the word in the preview and choosing an alternate. The app has really simple controls that you can learn right away in a seconds-long tutorial. They’re logical and easy to remember. For example, if you want to delete a word or character, just scribble it out. Easy. My one gripe is more of a feature than a shortcoming: if you want to indent or do any kind of formatting other than blank lines between paragraphs, you’re out of luck. On the other hand, this keeps me from editing much, so that’s a good thing for my purposes. MyScript Nebo is $7.99 for iOS; it’s also available for Android and Microsoft devices. I think it’s worth paying for because it’s so well made. P. S. I realize this sounds like an ad, but that’s because I just really like this app a lot. I have no affiliation with them, though, and they’re not giving me anything. I bought the app myself. P. P. S. It also does math (to LaTeX) and diagrams!